Convert images to .png and set background transparency. Is there a better alternative to pngweasel? Is pngweasel really the best app in Image Editing category? Will pngweasel work good on macOS 10.13.4? 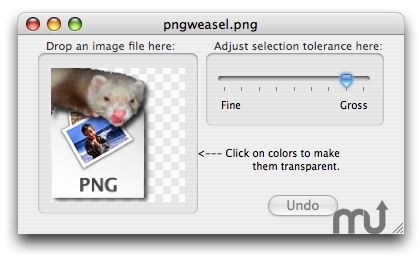 pngweasel is a fun little Mac OS X utility we put together to handle a common Web developer's task: converting an image to the PNG image format and making parts of the image's background transparent. Here then enters pngweasel, the cousin of gifweasel. It's lightweight, it's free, it's easy to use, and yes, there is a weasel. pngweasel needs a rating. Be the first to rate this app and get the discussion started!